As a first-time mum, this happened to me ALL. THE. TIME. I always made a point of showering when the baby was asleep and I always thought that I heard her crying — not to the point of running down the hall stark naked and dripping wet mind you, but enough to make me stick my head out of the shower and listen. I sometimes even turned off the water just to be sure. I stopped using the fan in case it was preventing me from hearing her cry. It was getting ridiculous. So then I got smart and started using the baby monitor when I showered (which we rarely use at home; her lungs are strong enough that I can hear the baby cry from anywhere inside the house! It also helps that we have an open-concept layout, haha.). Even with the baby monitor on, I still thought that I could hear Bean crying, so I would stick my head out of the shower and take a quick glance at the monitor… no lights indicating any sound, so she was still asleep. At least I was a bit saner this way and could shower without turning off the water partway through. Still, it was best when Bean got a bit older and didn’t spend all day sleeping & eating. I would put her in the bouncy chair in the bathroom with me while I showered and had what my mum calls a “mummy shower”. You know you’ve done it. Singing refrains of Old McDonald (or some other kid song) while suds-ing up your hair, peeking out of the shower periodically to make googly eyes at the baby and let her know that even though you’ve visually disappeared, you’re still right there, and managing to clean your entire body in 5 minutes, lest the baby need you. Let me tell you: it was a luxury when hubby was home on the weekend to keep an eye on the baby and I could take a glorious, relaxing, peaceful 10-minute shower with the fan on… ahhhh. Once I was back to work, I would get up and shower before Bean got up, and somehow, even though she was sleeping in a crib, I never once worried about hearing her cry while in the shower. Jump to present-day and somehow I am right back to that meme. I’ve been sick with a bad cold for the past few days (that I caught from the rest of my family…. I mentioned it here), and although I am feeling much better, it’s still with me. I have a cough and am congested. (I’ll spare you the details, but trust me when I say that this is much better than how it was.) El was fast asleep and I decide to have a quick shower (because, let’s be honest, I need one!). I could have sworn I heard her crying almost my entire shower (even with the fan off! ); not enough to turn the water off, but I sure as heck sped up my sudsing! As a second-time mum I am more realistic and realize that drying off and throwing on a bathrobe before going to pick up the baby is smarter than just booking it down the hall dripping wet. I quickly dry off and get as far as the bedroom door when I realize that there is no baby crying. Oh. Right. Good! So I go back to the bathroom and turn on the fan (since the water isn’t running, I can handle the extra noise), and the whole time I’m combing out my hair, I think I hear the baby crying. Only she isn’t. I get dressed and go and check on a rather peacefully sleeping little heffalump. Haha, joke’s on me! So why has this phantom crying baby returned to my shower? I might need to break out the baby monitor again until this cold disappears. What do you mommas do with the kids while you shower? (Respond in the comments.) 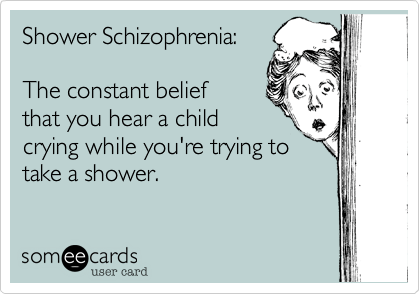 Apparently I’ve still got some learning to do about showering with kids underfoot (or rather, quietly asleep in a bed somewhere, haha! ).